Won't you share your Rokiskis related family photographs with us? They provide a slice of life from Rokiskis that would otherwise be lost to us forever. This is the information on the back of the photograph. Standing in the back are, from left to right, Ruvel Gafanovich and Yudel Weiner. 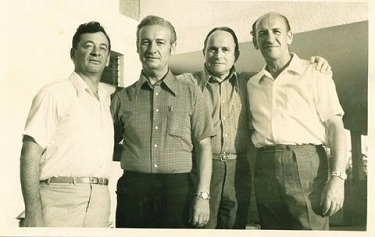 In the front, from left to right, are Yankel Chait, Motel Chaitovich, Chaim Kruk, and Leibe Ruch. 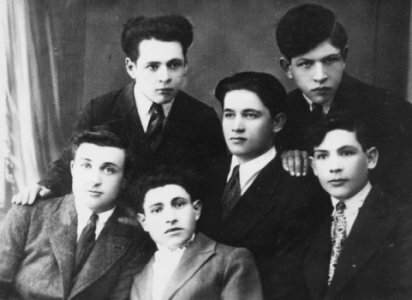 I send you a historical photo of four boys, members of Ha'shomer Ha'tzair Rokiskis, who with incredible effort, with inexhaustible aspiration for life, were lucky enough to escape from the murderers hands of death, at the cost of the lives of their dear parents, sisters and brothers. They were filled with HOPE to build a new life in the land Eretz Israel.